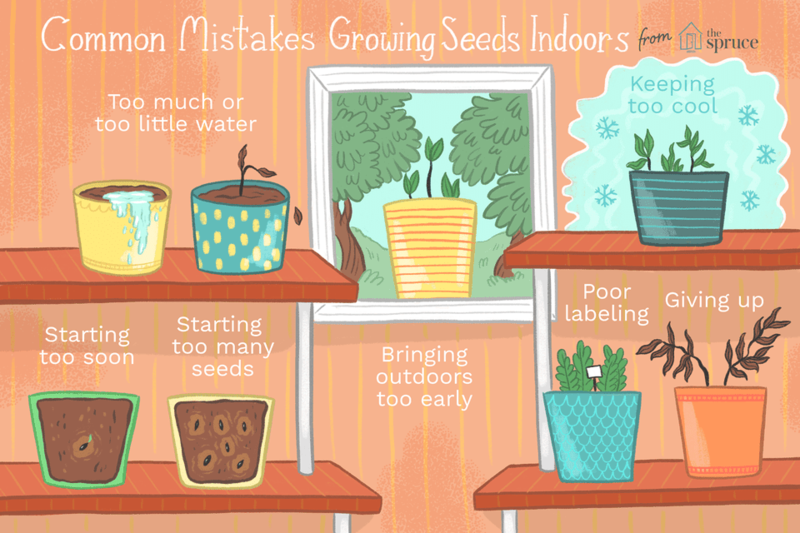 Growing seeds indoors isn't hard; it's keeping them alive that can be challenging. You can save a lot of money by growing seeds, but only if they live and turn into robust plants. Avoiding these 11 common mistakes will greatly increase your odds of success. Seedlings need a lot of light. No matter what anyone tells you, the chances are that you don’t have enough natural light in your house to grow robust seedlings. Even a South facing window usually won't do. You can, however, use artificial light; either get some grow lights developed specifically for plants or for a more economical solution, get some large fluorescent shop lights and put in one warm bulb and one cool. Hang the lights from chains so that you can raise them as your seedlings grow. Keep the lights as close to the seedlings as possible without touching (2 to 3 inches). After your seedlings appear, you’ll want to keep the lights on for 12 to 16 hours a day. To make this easier, you can easily hook up a timer to turn your lights on and off automatically. Give your seedlings too much or too little water—either way, they are toast. This is perhaps the most challenging part of growing plants from seeds. Because seedlings are so delicate, there is very little room for error when it comes to watering. You want to keep your sterile, seed-starting medium damp, but not wet. Cover your container with plastic, until the seeds germinate. Water from the bottom. By letting the plants soak up water through holes in their pots, there is less chance of overwatering. Check your plants at least once a day. Buy a self-watering seed starting system. Make a free, self-watering seed starter. Chas Gill, who runs the Kennebec Flower Farm, says that the biggest mistakes people make when starting seeds are, "they start their seeds too early." Lots of plants don’t like the cold, and exposing them to chilly air and soil will stress them out, and stressed out plants are more susceptible to pests and disease. Most plants are ready to go outside four to six weeks after you start the seeds. Seeds are finicky when it comes to how deep they like to be planted. Some seeds need complete darkness to germinate, and some like some light. This information is usually on the seed packet. If there isn’t any information, the rule of thumb is to plant seeds twice or three times as deep as they are wide. This can be a challenge to figure out, but if you're not sure, err on the shallow side—don't plant your seeds in too deep. For seeds that need light to germinate, you'll want to make sure that they are in contact with your seed starting medium, but not covered. To do this, first press the medium gently down to make a firm surface. Then place your seed on top of your medium and gently push down, making sure the seed is still exposed. When your seedlings are ready to go outside, after all of this babying, the last thing you want to do is shove them out the door and into the harsh world without significant preparation. The process is simple, though it can be time-consuming and a bit of a logistical nightmare. It is called hardening off. The idea is to expose your plants to the elements gradually. Practically, this means that you put your seedlings outside for more time every day throughout 6 to 10 days, depending on your patience, the temperatures, and the fragility of your seedlings. This prepares them slowly for the wind and sun. It certainly is easy to swoon over the gorgeous pictures and glowing descriptions found in the tons of seed catalogs that come flying through the ether and into our mailboxes every winter. If you buy many more seeds than you can start, it will become much more difficult to nurture them into adulthood. Work on self-restraint in this area, particularly if you are a beginner; starting modestly is the way to go. You can always do more direct planting in your containers when it gets warmer. For seeds to germinate, most must be kept warm 65 to 75 F. A favorite place to do this is on top of the refrigerator. There are special ​"seedling mats" that you can buy to put under your seeds. You can also use a small heater set on a timer placed next to your seedlings. You will only need to worry about this until the seeds sprout. After that, most can tolerate fluctuating temperatures (within reason). Whatever type of light you use, natural or artificial should produce enough heat to keep them happy. Get popsicle sticks and write the name of the seeds and the day you planted them in permanent ink. Stick it into the soil next to the seeds you’ve planted or label by row. When it comes to plant labeling, Sharpies are your friends. Taking photos with your phone always is a good idea for keeping track of everything. Starting seeds can be a real pain. It takes dedication, attention, and time. That said, you can’t beat eating a tomato that you have nurtured from day one. The biggest mistake in starting seeds would be to give up, even if you’ve made a few, or even a few hundred seeds starting mistakes. Don't Throw out the Bottom of Your Celery—Re-Grow It!